What did the Pope’s September 2010 trip cost Britain? Between the announcement of the Pope’s first state visit to Britain until he arrived half a year later, the projected costs that were acknowledged rose by about a half, while the Government tried to keep secret other expenses, including the enormous security bill. British taxpayers were obliged to foot most of the bill for a ceremony to move a 19th-century theologian one step closer to sainthood ― in the midst of brutal government austerity cuts. And to help pay for the Pope’s visit the UK Government quietly diverted money meant for the world’s poorest people. This beatification mass alone cost British taxpayers £1,673,000. Eleven members of the Pope’s entourage stayed at the five-star Goring Hotel, got a daily allowance for food, drinks and incidentals of £150 each, and ran up a lodging bill for the four-day trip of £17,546, thanks to the UK taxpayer. This appears to be the reason for the expensive change in the papal plans. In June, with the priests expelled, the Birmingham Oratory was put on the papal itinerary, and the beatification mass was switched to Crofton Park near Birmingham. Dropping the plans for the mass at the Coventry Airport after three months of preparations there proved expensive for the British taxpayer. The wasted time and money already spent in planning security cost the small Warwickshire Police force an additional £80,000. Within a year the funding cuts were threatening to force the removal of up to 150 of its officers from the streets. The expensive papal flip-flop won’t have helped. Naturally, no one expected the Vatican to pay for the cost incurred by Church tardiness in not sending away the Provost until six weeks before the announcement of the trip focused attention on the Oratory. 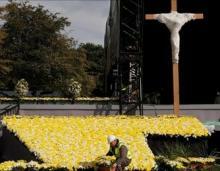 Floral displays in the Vatican colours were set up for the mass in Bellahouston Park near Glasgow. Because 35,000 seats remained unsold, a third of the total, the Catholic Church didn’t get as much back from tickets as it had hoped. 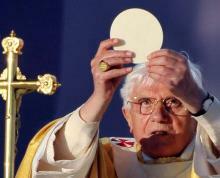 However, the British taxpayers got absolutely nothing back from the £264,030 that they contributed to the Pope’s mass. 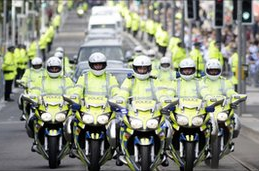 The security force responsible for the Pope in Glasgow, the Strathclyde Police, had just begun to drop 400 officers and 600 civilian support staff in the face of huge budget cuts,  yet it still managed to muster 1,116 officers to protect the Pope [a] and for the Strathclyde Police spent £649,203.54. But, like their colleagues in Edinburgh, they, too, received scant reimbursement from the Scottish Government, in their case £150,000, leaving them with a hole in their already strained budget. For a police force charged with trying to reduce gang-fuelled knife crime, losing more than half a million pounds is a serious blow. To guard one of the richest men in the world for half a day they will have to cut back on protection for people living in the most deprived areas of Glasgow. 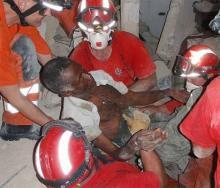 UK aid workers pull a survivor from the rubble a few days after the 2010 earthquake in Haiti. But later that year the aid budget was raided for £1.85m to help pay for the Pope’s trip. 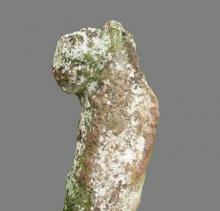 The opposition has called for this to be returned to the Department for International Development. Anthony Aust, an expert in international law, concurs. This does not include the contributions of the five other UK ministries involved: the departments for environment, farming and rural affairs; communities and local government; education: and international development. It also does not include the expenditures of the Scottish Government or the four city councils. And, of course, it does not include the massive costs of security. This was also confirmed in the official booklet: “The Pope in the UK” (pdf), The Catholic Bishops’ Conference of England and Wales and the Bishops’ Conference of Scotland, 2010, p. 24. 23. Strathclyde Police, “Freedom of Information Request 0138/2011”, date of reply, 17 March 2011. 29. Metropolitan Police Service, “Freedom of Information Request No: 2011020003220”, date of reply, 15 March 2011. 95.26 Members asked for details of cost of the forthcoming Papal visit. The Commissioner confirmed that estimated costs were £1.8 million of which approximately £0.8 would be opportunity costs. He added that at this stage these were very much early estimated costs. 32. West Midlands Police, “Freedom of Information Request No: 4383/11”, date of reply, 17 March 2011. 37. Home Office, “Freedom of Information Request, Reference 15447”, date of reply, 5 August 2010.